This wasn’t our first visit. We’d come here once before unintentionally – we were actually looking for the Friends International NGO’s restaurant, Romdeng, but got hopelessly lost and had lighted upon Naturae on the “any port in a storm” principle. Six months later our memories of the place had dimmed, so we came back to refresh them and, more particularly, to head down the street to The Shop to stock up on some more of their tasty chocolate. We ended up wishing that we’d taken the trouble to write up our review the first time round as we had vague recollections of having quite enjoyed it. Sadly, Naturae didn’t live up to expectations – and on the second visit we remembered all the things we’d found fault with on the previous occasion. It’s the “first exclusive organic bar and food store” of AsiaBio, a distributor of natural and organic products across South East Asia. They have a shop inside which sells a range of cosmetic and personal care products and some food – including, rather incongruously, raspberry jam from Scotland which wasn’t evidently organic. 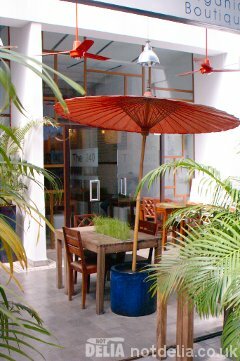 The outside tables, where we chose to sit, each have a potted strip of wheat grass in the middle. This looks very attractive, but it’s not at all practical if you want to share dishes. Looking through the menu we were reminded of the cheese and fruit platter we’d ordered on our last visit. It was a bit bland-looking – one of the cheeses was quite a nice soft cheese, but the other two were semi-hard cheeses with little taste to them. 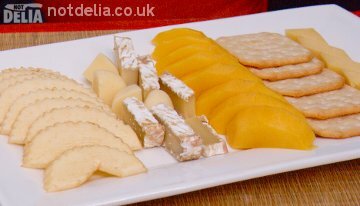 They’d been served with slices of tired, soft and tasteless dessert apple and of mango which was tasty, but really didn’t go with the cheese – and a few Tuc crackers, which we’d thought showed a lack of imagination. Nevertheless, since we were there and were hungry, we thought we’d better order. We had a starter ($5.50), a salad ($5.50) and a pasta dish ($8.00) between us. Our starter was roasted red pepper hummus and eggplant (aubergine) dip with vegetable sticks, French bread and salad. The red pepper hummus was enjoyable, although Mr ND thought it was a bit on the dry side. The aubergine dip was rather runny. As for the vegetable sticks, they consisted of four batons each of cucumber and carrot. The salad looked a bit bland and boring, consisting mostly of leaves with a drizzle of balsamic vinegar. 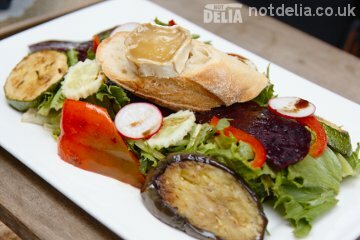 The goat cheese salad was described on the menu as “salad greens with roasted beets, capsicum, zucchini [courgette], balsamic and pesto drizzle”. The greens, again, looked a bit dull, and there wasn’t a great deal of evidence of the pesto drizzle. The beetroot and red pepper tasted OK but were huge slabs which looked rather clumsy. The aubergine (which wasn’t even mentioned on the menu) was another big slab, but was nicely done, as were the courgette slices. “What about the goat’s cheese?” I hear you ask. Yeah, what about it? Just one disc, perhaps four centimetres in diameter and less than a centimetre thick, melted by some means or other. Nice enough cheese, but there was precious little of it. 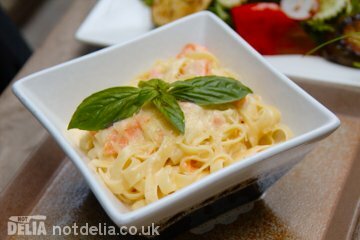 Our pasta dish was the smoked salmon fettucini, “julienne of smoked salmon in a garlic white wine peppercorn cream sauce”. It was OK. The taste was good but the texture was somewhat claggy. The serving staff were pleasant – they seemed a little shy, but they were friendly enough. At least the bill arrived a bit more promptly than on the previous occasion, when we’d had to wait an age for it. The bill came to $26.50, which is more than we’d paid for a delicious feast the previous night at Beirut. So the Naturae wasn’t good value for money at all. Overall rating: All in all, it was mediocre for what we paid, and I wouldn’t rate it any better than 2½ out of 5. We won’t be going back. Thanks for your comment. Sure, it’s a nice little place and the staff are helpful too. It’s just that on the two occasions we’ve visited, we’ve not been impressed by the standard of food, and also that the beer is overpriced and not very cold. I wonder if the time of day you visit might have something to do with it. Perhaps they’re good at lunchtime or dinnertime but not so good in the afternoon or something? We don’t visit places to intentionally give negative reviews. We want to enjoy ourselves and are delighted when we find something we could rave about. If we enjoyed the food, then we say so. Sadly, this place didn’t do it for us.